This is an authentic antique map of the western coast of Africa. The map was published out of Paris by the Department de la Marine in 1765. 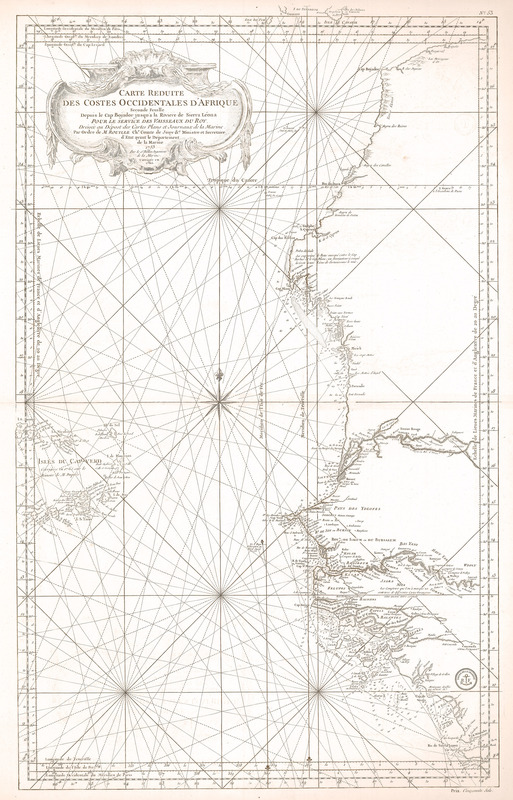 This scarce sea chart covers the western coast of Africa from northern Guinea to the southern border of Morocco. It includes portions of the Canary and Cape Verde Islands. As with most sea charts, the interior of the continent is predominantly void of any detail with the exception of a few river systems. In this map, the Senegal and Gambie Rivers are mapped several miles inland with numerous villages noted along their banks. The coastal areas of the map are filled with depth soundings, anchorages, hazards, ports, bays, and capes. More than half of the map is dominated by the Atlantic Ocean, which is shown under a web of rhumb lines, meridians, and lines of latitude. A compass rose punctuates the center of the map with a smaller magnetic north indicator shown along the Meridien de l’Isle de Fer. A large title cartouche ornaments the map in the top left corner just below several indicators of Longitude based on the meridians of Paris, London, and Cape Lezard. Condition: Map is in B+ condition, with slight paper browning along the margins. Map is in its original uncolored state with a strong impression on clean, thick paper.